1. Pre-heat the oven to 350°F. Have ready a baking sheet with a wire cooling rack on top at least 12” x 18”. 2. Trim the stem end of the tomatoes, split them in half lengthwise and scrape out the seeds with a small spoon. 3. In a large bowl, combine the tomatoes and all the ingredients and mix thoroughly. 4. Place the tomatoes cut side down on the rack. Spread the thyme branches and garlic on top. 5. Bake for 45 minutes. 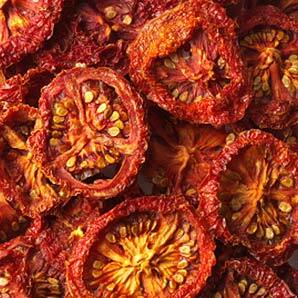 Turn the oven off and leave the tomatoes in the oven to dry overnight with the oven door propped open slightly. 6. In a pan over medium heat, gently warm the extra virgin olive oil and butter. Add the bread crumbs and mix well until they are coated. Continue stirring until they start to turn golden brown, then add the cheese and keep stirring until the whole mixture is toasted. 7. Remove from the pan onto a plate and allow to cool. 8. Cut the Queso Blanco cheese into pieces to fit the dried tomato, generously sprinkle with the crumble and bake a few minutes to soften the cheese. Drizzle with a little extra virgin olive oil and enjoy.